While I was in Hong Kong last week to oversee the production of one of our upcoming titles I was fortunate enough to visit an old friend. Bruce Lee. Few people know that I am crazy about martial arts movies and Bruce Lee was the most iconic presence in the genre. His skill and physical feats are legendary. 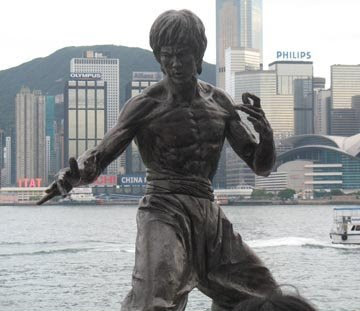 Each visit to the city I try to make it to the Avenue of the Stars on the boardwalk of Kowloon to see the statue of Bruce Lee. This occasion was more somber than usual since it was the 35th year anniversary of his untimely death on July 20, 1973. Bruce Lee is one of Hong Kong’s favorite sons and he is missed by all the world. So watch Game of Death and have a moment of silence for a master in martial arts. Fun at Home Shopping Network!